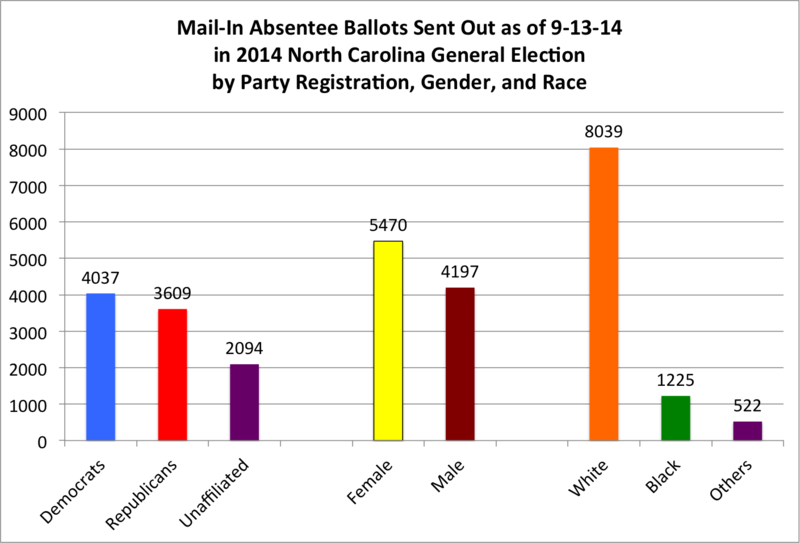 So far, nearly 10,000 North Carolinians have received their mail-in absentee ballots for the 2014 general election, and we have 4% of those ballots (379) returned. As to the requested ballots: it appears that Democrats are still requesting the highest percentage of ballots, reversing the traditional dominance of Republicans in mail-in absentee ballots. Among party registration, Democrats continue to lead in requested mail-in ballots, with 41% to Republicans at 37% and unaffiliated voters at 21%. The gender gap is pretty significant, with women requesting 56% of the ballots to 43% for men. Among female voters, registered Democrats are 45% to 36% Republican and 19% unaffiliated; among male voters, Republicans are 39%, Democrats are 36%, and unaffiliated are 24%. It appears, from at least these early numbers, that female Democrats are energized for this election, which could be a good early indicator for the Hagan campaign in the U.S. Senate contest. White voters are 82% of the ballots requested, while black voters are 12.5% and all other races are 6%. 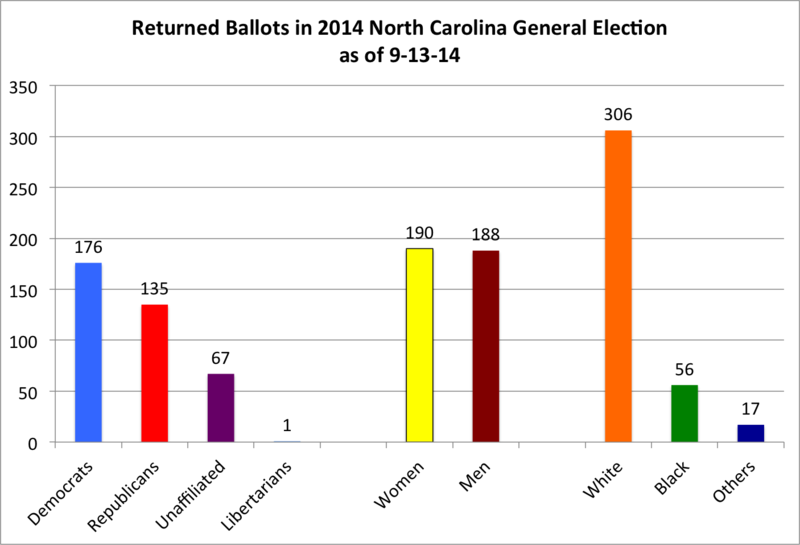 The gender split is pretty much gone, with women and men returning their ballots in nearly equal numbers. Granted, only 4% of the requested ballots so far have been returned. In terms of party registration of the returned ballots, 46% have come from Democrats, 36% from Republicans, and 18% from unaffiliated voters. White voters are 81% of the returned ballots, while black voters are slightly outperforming their requested ballot performance with 15% of the returned ballots. Voting has begun in North Carolina!